View of Bombay Green from the Town Hall, with the rotunda housing the statue of the Marquess Cornwallis, St. Thomas's and Church Gate. bl.uk > Online Gallery Home	> Online exhibitions	> Asia, Pacific and Africa Collections	> View of Bombay Green from the Town Hall, with the rotunda housing the statue of the Marquess Cornwallis, St. Thomas's and Church Gate. 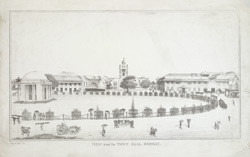 Lithograph of Bombay Green from the Town Hall showing the Cornwallis monument, the Cathedral Church of St. Thomas and Church Gate by Jose M. Gonsalves c.1830. The Cornwallis monument is a Neo-Classical single-storey structure with a cupola supported by fluted columns that contained a statue of Cornwallis by John Bacon. In the early 19th century, Cornwallis (1738-1805) was honoured through portraits, statues and monuments across India. Cornwallis was was the Governor-General and Commander in Chief in India from 1786 to 1793. He is credited with laying the administrative foundation of British rule in India and was given the title of Marquis in 1792 for his pivotal role in the Third Mysore War. The Church of St. Thomas, commenced in 1672 and formally opened in 1718, is the oldest English church in Bombay. In 1838, it became the Cathedral of St Thomas. Churchgate street led off Bombay Green to the west next to the church. In the 1860s, Bombay Green was remodelled to form Elphinstone Circle, which was renamed Horniman Circle in 1947.